Having recently walked on a combination of cleared, partially cleared, and uncleared walks, I’m not so sure…but I was in modern boots, and not my leather-soled repro shoes, which I prefer not to expose to the variety of modern snow-melting chemicals, though they can be cleaned. 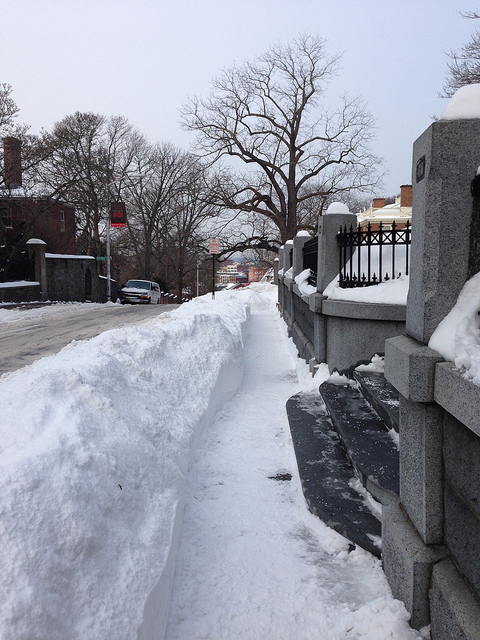 Still: the partially cleared and unsalted walk was easier to walk on than you might imagine, and I suspect that the 18th century tasks of clearing steps and paths to make room to walk or drive carts, wagons and carriages was probably reasonably effective– though the melting must have been more annoying and messy when mud season arrived. In all this cold and snow, how did people keep warm and stay fashionable? 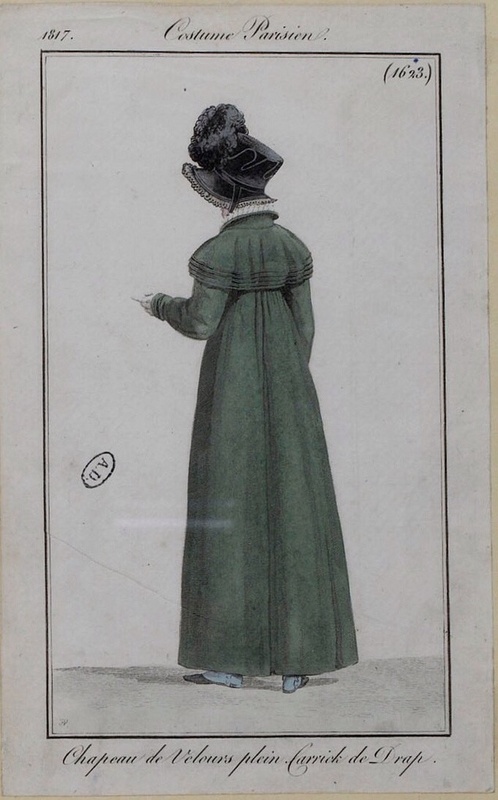 For gents, of course, greatcoats were an option, and cloaks or mantles for women, both in the last quarter of the 18th century and into the 19th. I found documentation for women’s Spencers and greatcoats in the first decade of the 19th century, but what about earlier? While I cannot (yet) place the coat at right in New England, you know I covet one. Tail pleats with back buttons, a possible shoulder cape? I love the menswear styling of this coat, and the drab-and-black color combination of coat, gown and accessories. I don’t have much call for 1787 clothing in my life (actually none whatsoever) but by the time I’ve patterned and made this coat (after many other things to finish), perhaps I will also have created a reason. 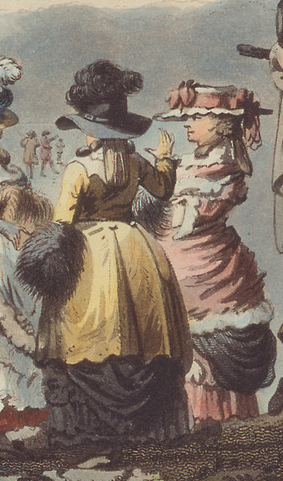 Winter frolics, New Year’s Eve party, 1788? Anything is possible, and time is better spent imagining fun than complaining about snow. The great coat is nice, but how ’bout them gaiters? Winter is firmly here, with the snow, fog and ice that marks the season in the Ocean State. It’s not fun weather for living in the past, though there’s not a lot of that happening right now. Even so, there’s a February program on the horizon and what better excuse for fastening on a garment and making it? 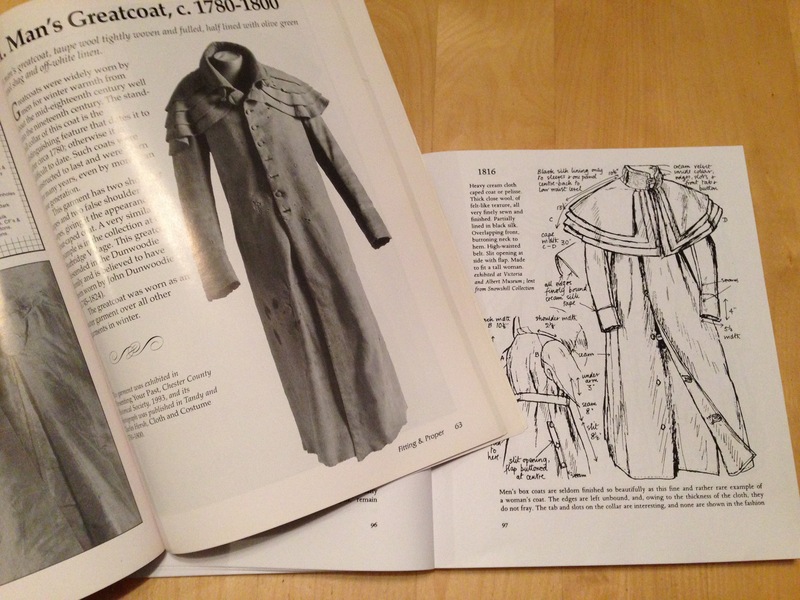 Even if I’ll likely spend the day in a kitchen interpreting life below stairs in 1820 (while the light infantry occupies my living room and denudes my kitchen), an early 19th century event on a winter weekend seemed a worthwhile excuse for making a greatcoat, and, eventually, gaiters. With no pattern, and only 2 and 3/4 yards of thick, soft, grey double faced wool*, I’m adapting my standard Spencer pattern. I didn’t upsize this too much, because women didn’t have frock coats and waistcoats to wear under their greatcoats or Carrick [carriage?] coats or Reding cotes. (I’m too engrossed with sewing to parse garment names.) The skirts will be attached at the waist, with a belt to hide the seam. At my height, cutting a back in one piece takes yardage I do not possess. 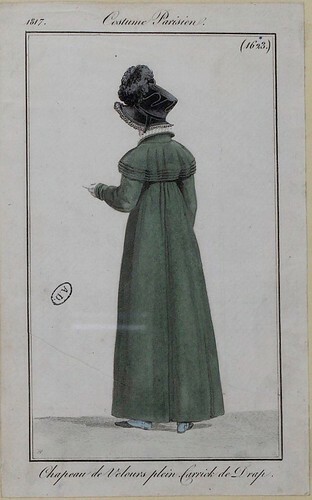 Happily, the Taylor’s Instructor describes Redingcoats or Habits for women with attached skirts. It’s a new collar shape. 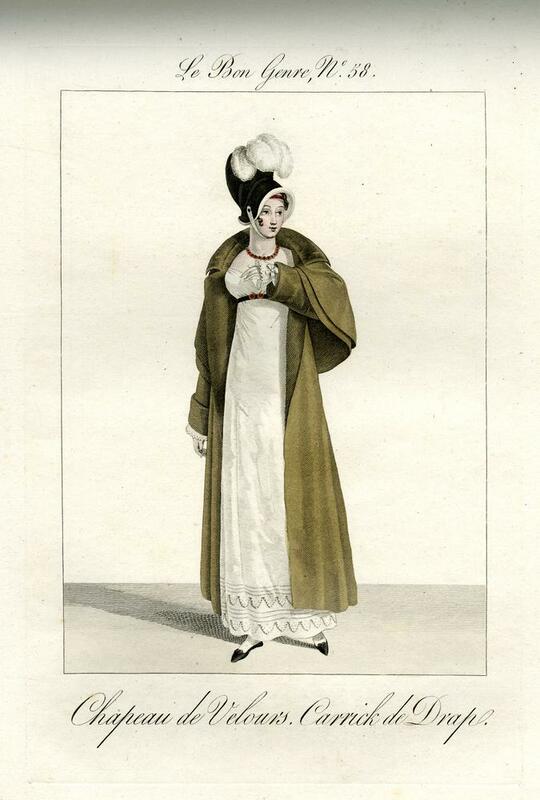 The collar shape diverges from my usual 1790s collar, and is based on another fashion plate, this time from 1815. The program I’ll be doing with Sew 18th Century is set in 1820. 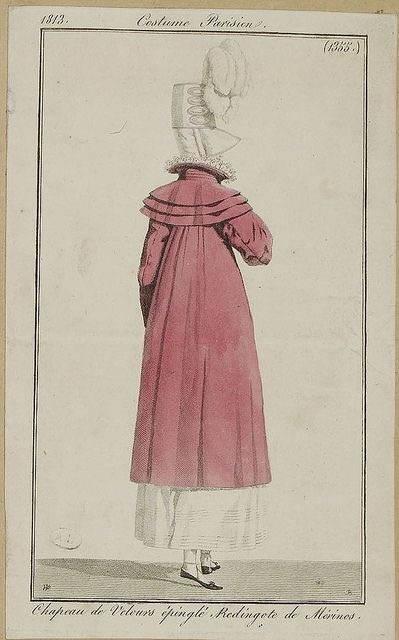 As a maid, I think an 1815 coat is pushing it a bit, since red wool cloaks hold up well, but I’ll take any excuse for some tailoring, I suppose. 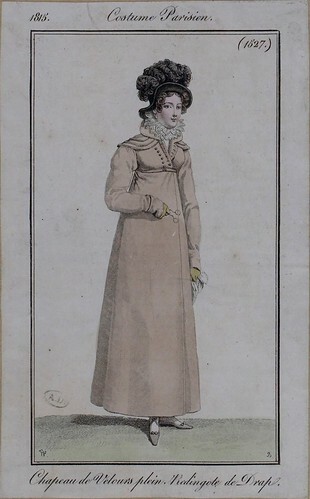 1815, with a round collar that can stand up. I plan to use this button arrangement, too, stylish as it is in not-quite-double breasted. Bring on the button-making– we all have to go death’s head sometime, and this wool is too thick for covered buttons without much heartbreak. The lower front pins are there from the moment when I realized the front was hanging strangely — because I had neither marked nor sewn the bust darts. That oversight, and the pain in my ear, do suggest that the delightful cold I’ve had for weeks may be affecting me more than I think– but that’s just another argument in favor of a cozy wool coat. The sleeve pattern (again, not upsized) is once again the old standby two-piece sleeve from Henry Cooke’s 1770s unlined man’s frock coat, so of course it fits well. I’m hoping to stitch up the sleeves this evening, and set them later this week. I’m still pondering lining materials– there’s just enough silk “persian” to do the body and sleeves–but I have some twilled wool that would increase the warmth and still provide some ‘slip’ in the sleeves. And those blue gaiters? 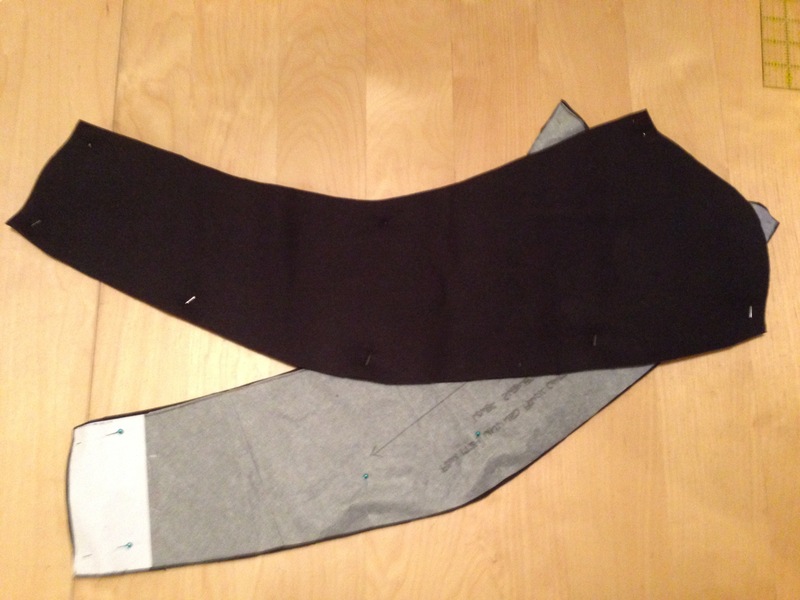 They’ll come in time, from the scraps of blue wool a friend is making his first ditto suit from. I’ll spot him some remnant table chintz for a summer waistcoat, and expect greater sartorial splendor will grace the spitting stamp inspector in Newport this August in exchange for my blue wool ankles. *Holy burned hair smell, Batman! Mr Cooke’s right when he says this almost feels like foam, but put a flame to it, and you might as well be smoking sheep.